This week, I discovered how Wright’s Usonian style endeavored to use his architecture to both express and mold the shifting American psyche. At the same time, I tried to determine the educational factors influencing interest in architectural careers by sending out surveys to the architecture apprentices at Taliesin West, the high school seniors at BASIS Scottsdale, and sixth- grade art students at BASIS Scottsdale (Thank you everyone for responding!). 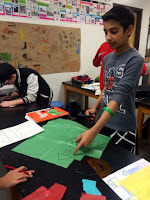 More experimentally, Mr. Cleland kindly allowed me to test the effectiveness of my Robie House geometric leaded glass lesson plan on his sixth grade students. All this activity will supply data on how Taliesin West can best tailor its educational outreach to encourage aspiring architects. Not only was Frank Lloyd Wright continually on a quest to deconstruct the box—moving supports from the corners to the center, ringing bands of art-glass windows around the perimeter, innovating glass corner windows—the architect simultaneously sought to reconstruct American society. In the 1930s, Wright created two visions for the new American lifestyle: one utopian, the other practical. 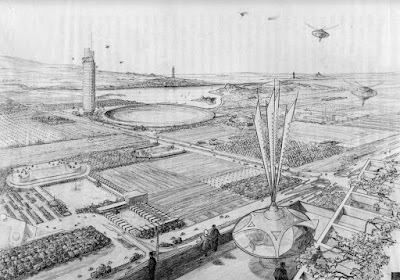 His plans for the imaginary Broadacre City proved both fanciful and foresighted—a more aesthetically pleasing forerunner of Levittown’s later birth of suburbia. 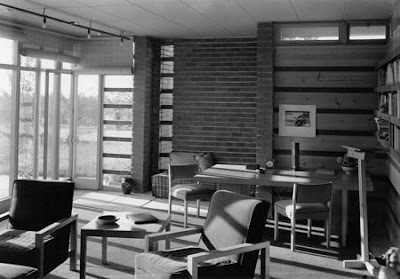 However, his affordable and attractive Usonian homes ushered in a new era of ranch-style housing for the middle class. Retreating from the scandals of his three marriages and two fires in the 1920s—his own personal Depression years—Wright sought refuge in his work: penning his autobiography, expanding his Taliesin home to teach students at the Taliesin Fellowship, and conjuring up an antidote to the rampant urbanization which he found so unnatural. 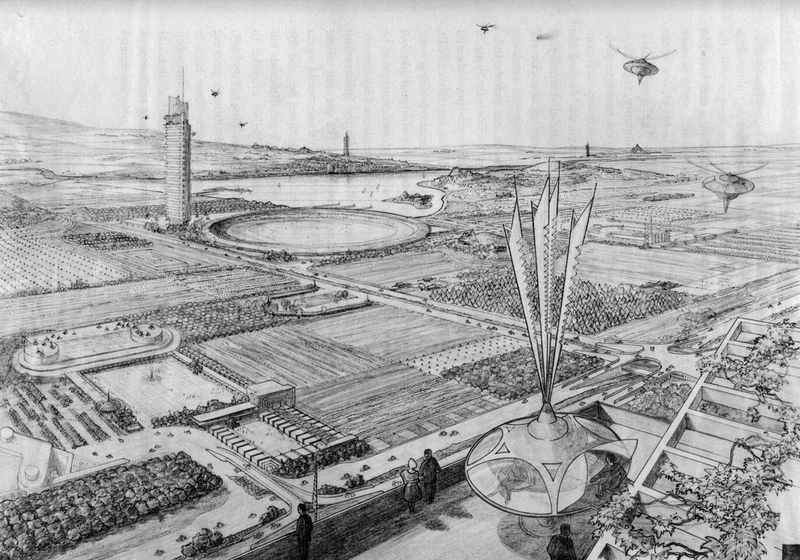 Wright, together with his apprentices, translated his social ideals into an architectural model called Broadacre City, which resembled the yet-to-be created suburbs but with the caveat that every home would enjoy a small plot of farmland, providing self-sufficiency as a shield to the Depression-era scarcity. 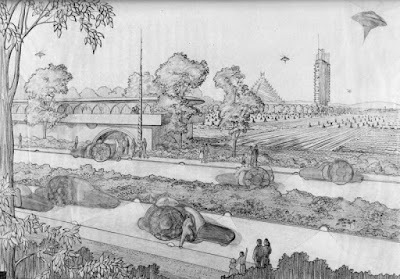 The model of his dream city—actually a decentralized non-city—toured the country to much acclaim, rebuilding Wright’s reputation along the way (Thorne-Thomsen, Frank Lloyd Wright for Kids). For Wright, architectural design could solve social issues such as overcrowding and alienation of urban life. Technology was to be helpmate to nature. Wright loved the relatively-new automobile and electricity, giving Americans the freedom to spread out. 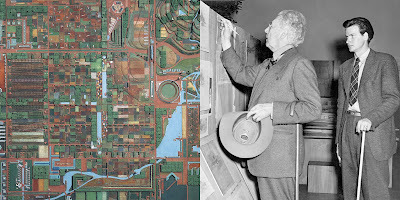 Broadacre City seemed a democratic alternative to Soviet communism of the day: Wright believed that giving every American an acre of land would restructure society in a more democratic way (Novak, “Broadacre City: Frank Lloyd Wright’s Unbuilt Suburban Utopia”). Moving from fantasy to reality, Wright tackled the need for new, inexpensive housing as the U.S. climbed out of the Great Depression in the late 1930s and 1940s. His prior clients had all been wealthy, indulging Wright’s tendency to come in over budget. Wright perceived that the American lifestyle was changing, and he wanted a new architecture to serve the needs of the average American. 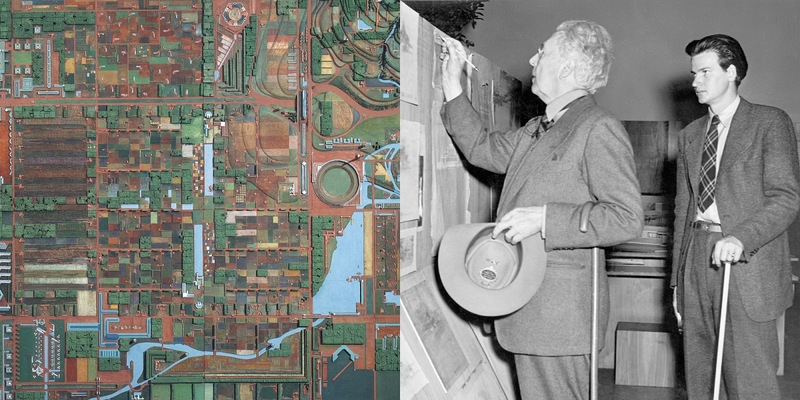 The idea for the Usonian house style first came to Wright as he was designing Broadacre City. While many architects at the time argued that Wright’s one-family houses were counterproductive to solving the rapid population growth in cities, Wright viewed “family homes as autonomous estates in a presently shiftless, rootless mass society and as a humanization of that society” (March, Forward of Frank Lloyd Wright’s Usonian Houses: Designs for Moderate Cost One-Family Homes). 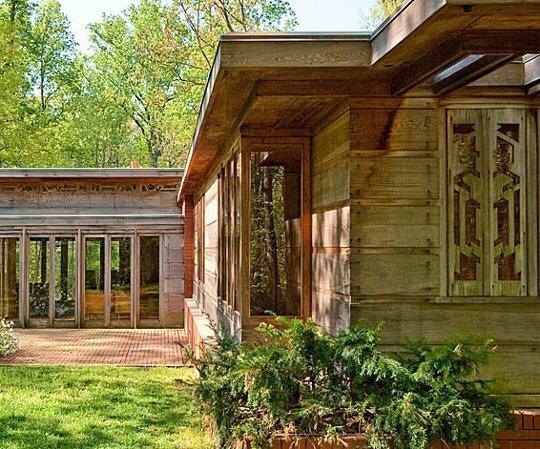 No one is quite sure why Wright named this style “Usonian.” Perhaps it is from the discussion swirling in Europe about whether the acronym for the United States should be changed to U.S.O.N.A. (The United States of North America) to avoid confusion with the newly formed Union of South Africa. 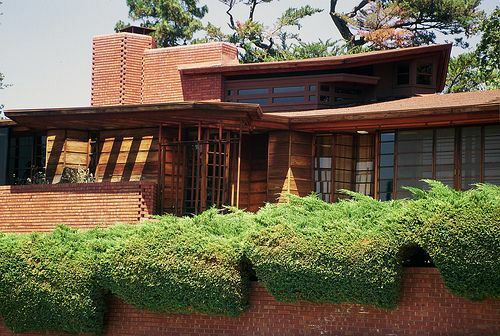 Whatever the origin, the name grew to encompass Wright’s vision for the reformed American society he tried to effect for the last 25 years of his life (Sergeant, Frank Lloyd Wright’s Usonian Houses: Designs for Moderate Cost One-Family Homes). 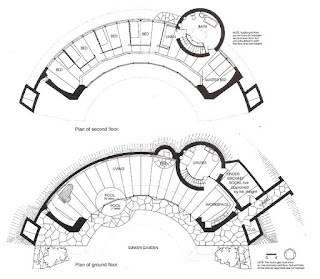 Wright latched on to this idea to describe his desire for a distinctly American architecture that was both organic and Usonian, stemming from Wright’s belief that a culture or individual should grow “out of the ground and into the light” (Sergeant, Frank Lloyd Wright’s Usonian Houses: Designs for Moderate Cost One-Family Homes). Usonian houses were modern, simple, and dynamic, designed to reflect the American psyche and landscape. 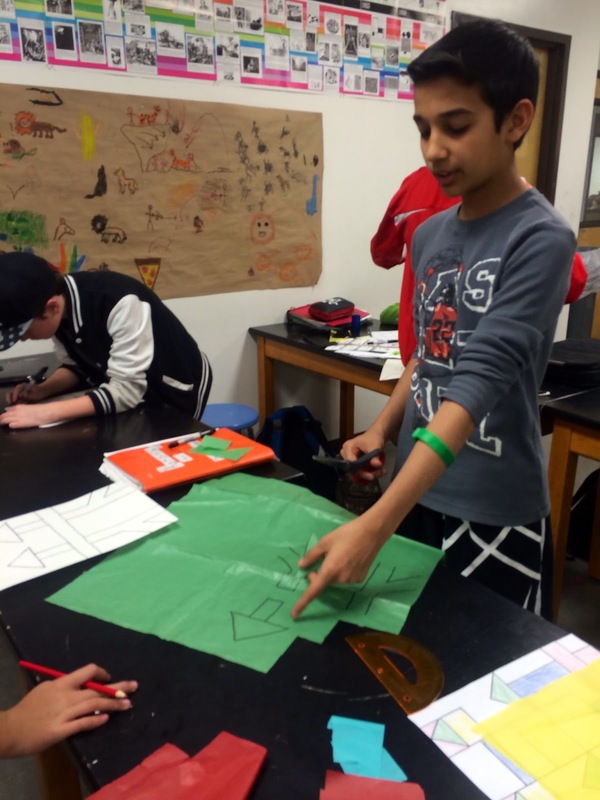 Diagonally cutting the box in half, a triangle emerges. 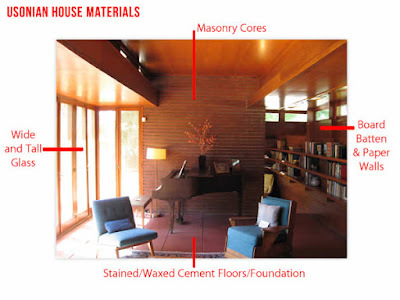 Wright then further deconstructed that triangle, leaving only the L-shaped edge, an organic shape Wright called a “polliwog” and capable of adjusting to meet the needs of a growing family (Sergeant, Frank Lloyd Wright’s Usonian Houses: Designs for Moderate Cost One-Family Homes). Often L-shaped to provide privacy and maximize garden space, these single-family, one-story buildings were highly standardized and modest to make them affordable for the average American family. Garages were essential components of the suburban homes, as Wright recognized the importance of cars to the modern American (“Key Works of Modern Architecture by Frank Lloyd Wright”). Wright’s Usonian houses were not only simple in shape to reduce cost but were constructed of simple materials: only brick, wooden planks, and glass. Wright further implemented flat roofs to allow for natural cooling and to remove the need for rain gutters (rain just ran off). 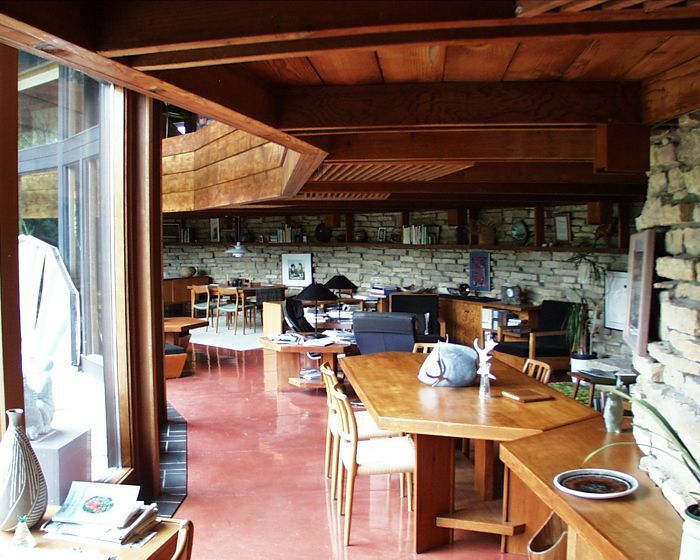 However, possibly the most innovative aspect of the Usonian houses was their radiant-floor heating systems. The houses were built on top of a slab of concrete fitted with hot-water pipes that ran beneath the floor. The heat from these pipes would radiate through the floor and heat the entire building (“Key Works of Modern Architecture by Frank Lloyd Wright”). He banished squared-off and sealed-off kitchens staffed by hired servants. The kitchen became a workspace in the center of the house, open to the dining area which also relinquished its separate room status and morphed into an alcove of the living room (Lind, The Wright Style). Not only did Wright eliminate unnecessary walls, he banished the need for skilled craftsmen by introducing a grid system to make construction what he called “Usonian Automatic.” These “little do-it-yourself house[s]” epitomized Wright’s much-praised quality of “tenuity”: steel reinforcing embedded in concrete that allows push-and-pull and makes it “virtually indestructible,” a technique he used to build the Imperial Hotel that survived Japan’s catastrophic earthquake in 1923. Because a worker only needs to follow patterns in the grooved edge of blocks, skilled craftsmen are not needed (Frank Lloyd Wright, His Living Voice). This inventive horizontal planning grid—what Wright called a “unit system”—was a rectangle measuring two by four feet. Masterminding the construction, it was even etched into the actual concrete floor. Using only two by fours reduced waste further. 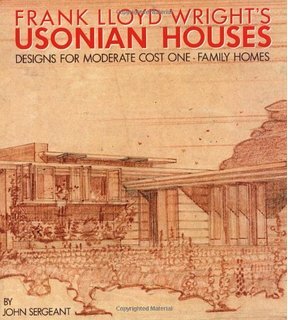 In this way, Usonian almost self-build homes further the cooperative communities espoused in Broadacre City (Sergeant, Frank Lloyd Wright’s Usonian Houses: Designs for Moderate Cost One-Family Homes). 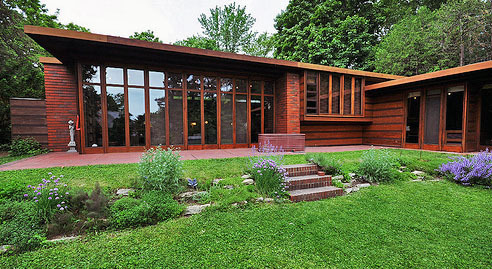 Sixth on the list of Wright’s UNESCO-nominated buildings is the first Usonian house that Wright built: the Herbert and Katherine Jacobs House, completed in 1937 in Madison, Wisconsin. Incorporating the above-mentioned Usonian architecture, Wright delivered a low-cost, simple but elegant, and, above-all, organic home. Built on a small plot of only 144 square-meters, the Jacobs House, like many other Usonians, has its back to the street, giving residents privacy. The walls on the side of the house facing the street are composed almost entirely of horizontal ponderosa pine planks; whereas the walls facing the private garden are mostly glazed glass, entreating the eye to look outward and for residents to spend more time outside (“Key Works of Modern Architecture by Frank Lloyd Wright”). Not only was the family connected to nature, but they were connected to each other. 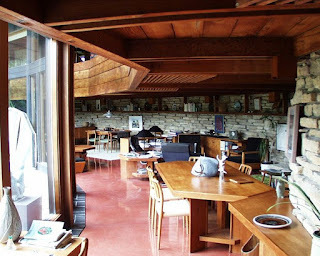 Like Wright’s other homes, the Jacobs house was constructed on an open floor plan which connected kitchen to dining room to living room, allowing the mother to watch her children or entertain conversation with guests as she prepared meals (“Key Works of Modern Architecture by Frank Lloyd Wright”). Of course, Wright did not neglect the beauty of the design. Usonian houses boasted their own geometric grill patterns covering windows to inexpensively reproduce the effects of his leaded-glass windows. The dining alcove was lit by a “light bridge” made of pine encasing incandescent recessed lighting. Ceilings were wooden battens composing long geometric patterns (“Key Works of Modern Architecture by Frank Lloyd Wright”). 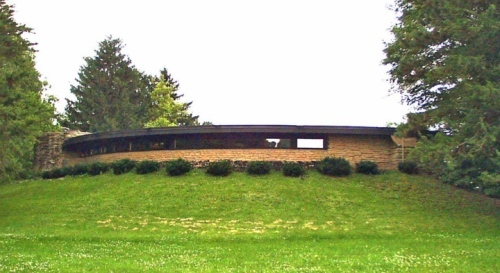 In addition to a planning grid which sped up the building process, the Jacobs House marks the first time that Wright utilized “sandwich-wall” construction of walls, adding a minimalistic design pattern to the walls, negating the need for expensive wall décor. 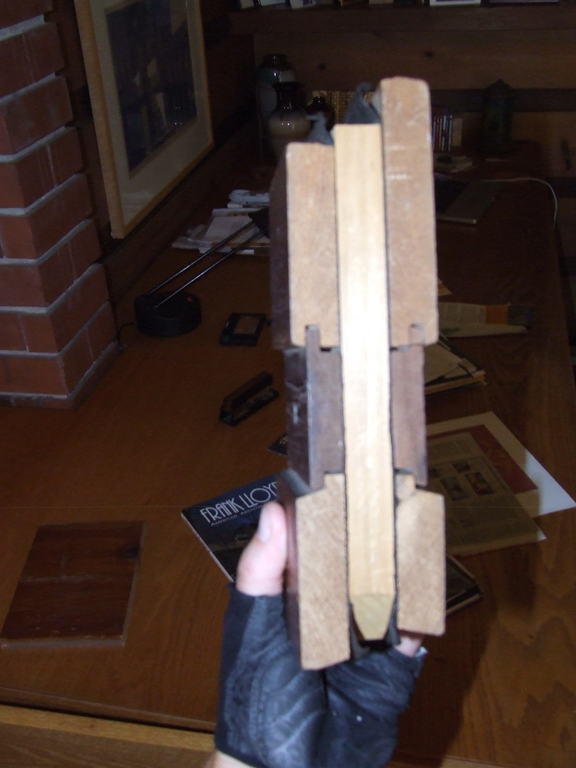 Wright’s sandwich walls have three layers: “two pine boards with a plywood core sandwiched between them.” Form meets function: redwood battens screw-fashion the surface pine boards on either side of the insulation-containing plywood core, creating a fireproof and attractive horizontal pattern (“Key Works of Modern Architecture by Frank Lloyd Wright”). 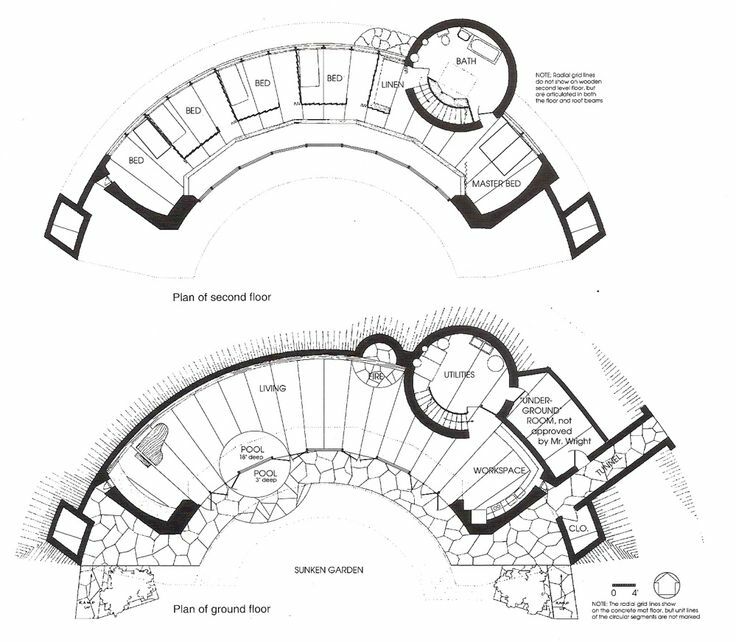 Interestingly, Wright later designed a second Usonian house for the Jacobs in 1948 based on a solar hemicycle, aligning the sun’s rays to warm the interior, continuing Wright’s obsession with natural light. 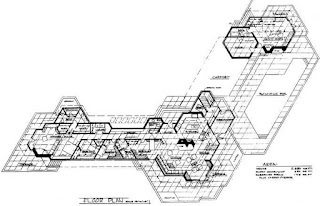 Other Usonian houses expanded upon the Jacobs House grid system. 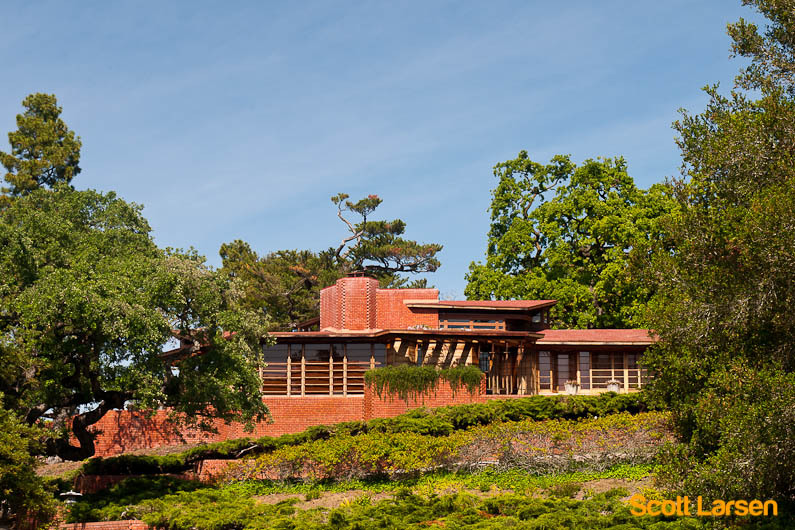 The most famous of these is the Hanna House in Palo Alto, based on the design of a hexagon and the 120-degree angle, instead of the traditional 90-degree angle, to further deconstruct boxlike rooms (Lind, The Wright Style). 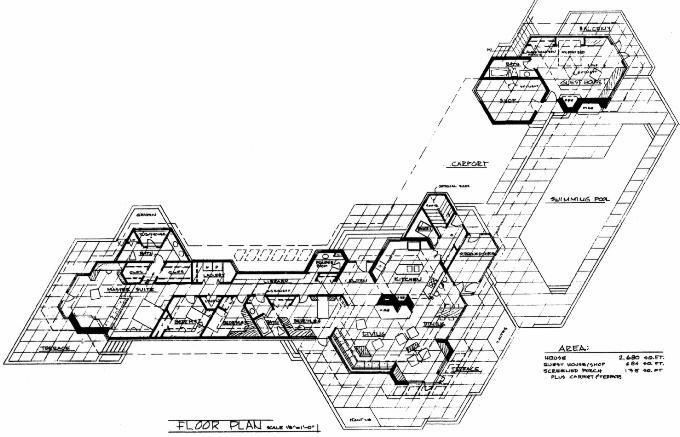 My lesson plan for the Jacobs House module focuses on creating floor plans for the new shift of American life in the Information Age—evoking sustainable materials, green building, and streamlining technology. 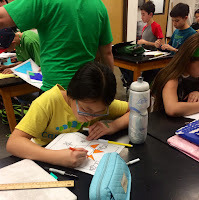 What was your favorite part of working with the sixth graders? What part was most challenging? Will you be sharing survey results in coming weeks? Was the response rate highest among a particular demographic? My favorite part was seeing each sixth grader's different personal interpretation of similar natural forms--their imagination. 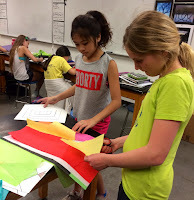 The most challenging part, however, was getting the students to focus on the detailed work. I might wait for the final presentation to share the survey results, but I probably will make some generalizations soon. The sixth graders had a 100% response rate because they were a captive audience--I handed out the paper surveys before and after the project. So far, I have been pleased with the seniors' response rate--almost 50%. I have yet to find out the results of the M.Arch students' surveys. I will be able to access the survey results later this week. Your blog is so detailed. I really liked how you linked Wright's architecture with the historical times he lived in. I missed you drawing this week! Although don't be pressured to do them, since I'm sure that they are pretty time-consuming. Anyway, I like that you put a lot of Wright's work into historical context. In this instance, it seems like the Usonian homes were inspired more than by the onset destitution of the Great Depression than the nature that seem to inspire so many of Wright's previous works. Would you say that this is a departure from the previously more environmentally-inspired structures or that there exist precursors of this practicality in them instead? I think that nature was still the prime motivator for his Usonian houses. 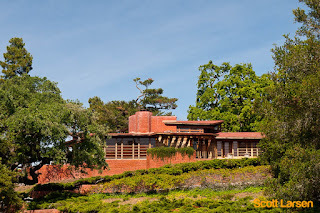 Wright, I believe, wanted to design homes so that the average American could appreciate nature in their living spaces. He thought that the new technology could make it easier than ever to do this for everyone, instead of expensive custom work for the wealthy.